Though several residents of the Ang Mo Kio Housing Development Board block of flats heard a loud crash sometime after midnight early Friday morning, none of them made their way downstairs to investigate. "Vegetarian?" Aunty Lee guessed. Inspired by an American vegetarian acquaintance, she had recently started experimenting with vegetarian versions of traditional Peranakan dishes. 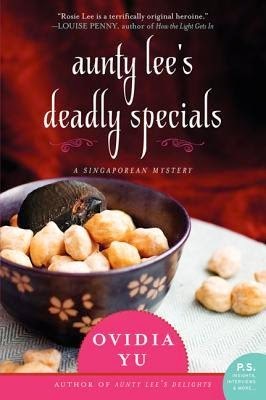 About Aunty Lee’s Deadly Specials by Ovidia Yu: Rosie “Aunty” Lee, the feisty widow and amateur sleuth and proprietor of Singapore’s best-loved home-cooking restaurant, is back in another delectable, witty mystery involving scandal and murder among the city’s elite. Few know more about what goes on in Singapore than Aunty Lee. When a scandal over illegal organ donation makes news, she already has a list of suspects. There’s no time to snoop, though—Aunty Lee’s Delights is catering a brunch for local socialites Henry and Mabel Sung. Rumor has it that the Sungs’ fortune is in trouble, and Aunty Lee wonders if the gossip is true. But soon after arriving at the Sungs,’ her curiosity turns to suspicion. Why is the guesthouse in the garden locked up—and what’s inside? Where is the missing guest of honor? Then Mabel Sung and her son, Leonard, are found dead. The authorities blame it on Aunty Lee’s special stewed chicken with buah keluak, a local black nut that can be poisonous if cooked improperly. She’s certain the deaths are murder—and that they’re somehow linked to the organ donor scandal. To save her business and her reputation, she’s got to prove it—and unmask a dangerous killer. This sounds like a delightful cozy in an unusual setting. I'll read this one. My Friday post features Miss Julia Speaks Her Mind. If you like the sound of this, I suggest you find the first book which is more an introduction to the characters -- although you can certainly read this first and not suffer from it ;) Happy weekend, Sandra! Ooh this sounds like a lot of fun! In the Beginning I was wondering why no one made their way downstairs, but then a lot of people aren't very close to their neighbours! If someone died at a party I was catering I'd be terrified it was actually me, but then Aunty Lee is probably more confident in her cooking skills ;) I hope you enjoy this one! Thanks for sharing :) hope you have a great weekend! I think people just want to mind their own business, maybe? Oh I have every confidence in Aunty Lee -- she was framed, FRAMED! Sounds delightful! I wonder why nobody investigated the loud crash? You have piqued my interest. I think you may enjoy this series, Laurel-Rain! Cozy mystery all the way! I don't think I would be one to run down and investigate either. To me, staying behind closed doors is always the safest option. Unless of course, the intruder, fire, etc. is targeting my house :P Great post! I guess it depends on where you live. But true -- better safe than sorry. What a bunch of busybodies ;) But caring ones! This sounds so cute and funny. I have this book too. Thanks for the feature. I am sure it will be a very fun, cute read. Oh it is! I think you'll enjoy this, Elizabeth! I had Aunty Dee's Delights tour my site way back when, so I can imagine that this is decent. Yep, this is the second book, and it's a goody! This sounds really cute. Delicious cover too! Thanks for sharing!